As much as I may not want to admit it, some days it’s hard finding the time to make a healthy meal. I know there are meal replacement shakes and protein shakes for people like me, who have a hard time making time for breakfast, but there is just something about the concept that bothers me. If I want a shake, I tend to think I might as well juice, or make it myself using fresh vegetables and fruits. Don’t get me wrong, some of those shakes are delicious, but there is just something delightful about having a delicious drink make from natural, organic ingredients. While I have a Vitamix, I usually avoid using it because in all honesty, it is messy. Cleaning the container isn’t easy and I can never find my pressing stick when I need it. For a while, I had given up on using a blender to make many shakes or soups. While I loved my blender, I just couldn’t handle the mess on a regular basis. Just as I was about to give up on the whole concept, I was approached by Ninja, who asked me to review their brand new Ninja Ultima Blender. Since I didn’t even know Ninja made such a powerful blender, I was intrigued. To say the least, I bought a lot of wonderful vegetables and was determined to put it to the test! With a powerful 2.5 peak horsepower motor (24,000 RPMs), you can enjoy making anything from homemade sauces to whole fruit juices. To make life even more convenient for you, it also has 2 Nutri Ninja cups with sip and seal lids, allowing you to make personalized drinks to quickly bring with you on the go. With Ninja’s advanced High Speed Cyclonic Blades ™ and Total Crushing Blades ™, you have a professional quality blender without the scary price tag! If you have a Vitamix, you may even be surprised how it compares to its competitor. Check the video below to see The Ninja Ultima Blender and Vitamix comparison! I know as a long time Vitamix owner, I was very surprised! I have to say that I am very impressed with the Ninja Ultima Blender. For our first test, we decided to make smoothies. Not only did it do a fantastic job crushing ice, but gave us restaurant quality smoothies. The ice was smooth and there were no small ‘chunks’ that you sometimes get while making homemade smoothies. What impressed me the most about it though was all the safety safeguards and built in mechanisms to make sure that the Ninja was as safe AND mess-free as possible. Once you have everything in the Ninja, the lid locks as well as the canister itself. You have to truly try to make a mess once the Ultima has started and since it doesn’t easily open, you don’t have to worry about kids accidentally going near a moving blade while helping in the kitchen or removing the top to make a mess. Clean up was also extremely easy, allowing my husband and I to relax instead of trying to move our hands inside the canister itself to deal with blades. To say the least, the Ninja Ultima Blender is much more user friendly than our previous blender. Based on our own experience, I am delighted to give the Ninja Ultima Blender an A+ rating! Would you like to purchase this awesome blender for your own family? You can purchase Ninja Ultima Blender at Amazon.com or from the Ninja website. You can also buy certain models of this blender at many retailers, including KOHLs, Target, Wal-Mart, and Bed, Bath, and Beyond. If you want to learn more about this blender or see some of the latest offers, make sure to check out Ninja on Facebook and Twitter! This looks awesome! I have been thinking about purchasing a blender for a while now, and this one in particular looks like it is hassle-free and can do a lot more than a normal blender. Thanks for sharing! I think this blender is somewhere near the top of my wish list right now. I’d love to have a good blender so I can make my own nut butters and hummus and lots of other great stuff! I need to make my own almond butter! As someone who makes fruit smoothies every morning for breakfast on the go, this would be awesome. It’s also nice to know it crushes ice well because that is my complaint with my current cuisinart blender. Thanks for such a thorough review. I have been trying to decide what my next blender should be (for baby food, smoothies etc). The Nijia is now on my list! I know someone who has a Ninja and it is so amazing! I would love to have one for myself and my Grandson! I have read so much info about the Ninja Ultima Blender that I would love to get one. I cannot believe how versatile it is. From being a Food Processor to an ice cream machine. That is so incredible. The blender looks to be a very solid piece of equipment and is a very good size to do alot of things. The cup capacity is another thing. I love making things and this will be a 2 thumbs up rating and 5 star rating from me. I have always wanted a ninja blender, but have never been able to afford one. I would love to get one and give a great review. Trying to change to a more healthy yet tasty diet for myself is hard enough , but encouraging teens and younger kids to do the same will require some creativity. The Ninja Ultima blender can be that safe , effective and easy to clean up way to make those smoothies, slushes and shakes a great substitute for sugary drinks. My friend has a Ninja Ultimate Blender and loves it! It makes the most luscious smoothies ever. He has lost 40 lbs. and he owes it all to the Ninja Ultimate Blender and his new healthy regimen of smoothies. Thank you so much for talking Ninja into donating this wonderful blender package. I would love to have one of these blenders, so if the Ninja gods agree, Yeah!!!! My brother visited last week and told us how much he loves his Ninja Ultimate Blender. He uses it in the morning for smoothies and for all types of recipes. He told us how easy it was to clean by putting water with a tiny bit of dish soap and turn it on for a couple of seconds. He convinced us it was something we need and want. It really is awesome. I will say too though that it is also dishwasher safe. I am still unsure how this is better from a regular blender / food processor. I would really have to try it for myself to be convinced of its superiority. One of the big reasons it is better than a traditional blender is the quality of blades, horsepower of the motor, and the control over the speed. I know growing up before my family had their Vitamix we went through a blender a year just by trying to blend ice and hard vegetables. It seems expensive at first glance but over time saves you a ton of money. Oddly enough, my first ‘nice’ blender when I went out on my own was my husband and I bought an original Vitamix from the 80s. It didn’t burn out until a year ago and was heavily used. The Vitamix I have now was actually another hand me down. 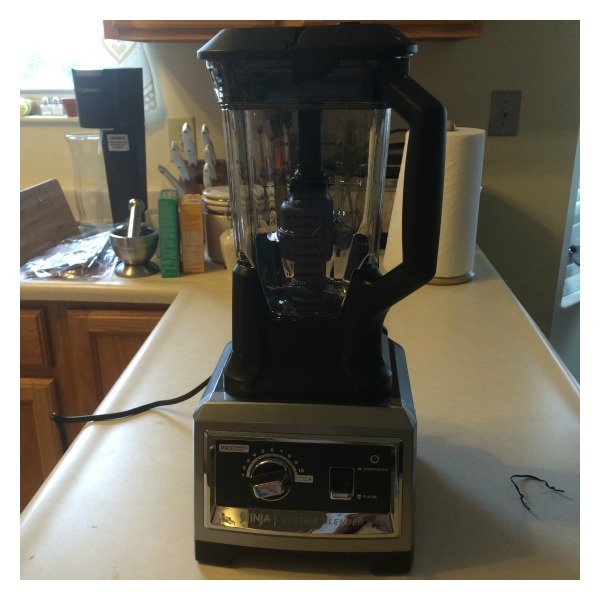 Since I own both a Vitamix and Ninja, however, I feel comfortable comparing the two. The Ninja really is so much more convenient and the fact it is dishwasher safe is a huge time saver. I’ve been wanting a Ninja since I saw the infomercial. They look so cool! I’m a huge fan of milkshakes and I’d love to make some fruit smoothies too. Oh the things I could do with this blender! These are really great to make your own nut butter! My sister has one and I’m so jelly! I have a smaller ninja and it’s amazing, I can’t imagine how fantastic this one is…I need it!!! Thank you so much for the great review. My mother has had her blender for over 30 years and I know it is time to get her something new. After reading your review, I am seriously considering buying her this for her birthday later this year. She makes smoothies 3-4 times per week and her poor old blender is on its last legs. I have been wanting a really nice blender for quite some time now. This one looks pretty fabulous, to say the least. I love that it’ll do so much more than many other blenders can even attempt. I like it! Thanks for the information, I was just looking at Ninjas today online. I’ve been researching them and wondering how well they work. I love the idea of having the Ninja cups with sip and seal lids for on the go drinks. That would be so handy for a breakfast smoothie on a rushed morning. 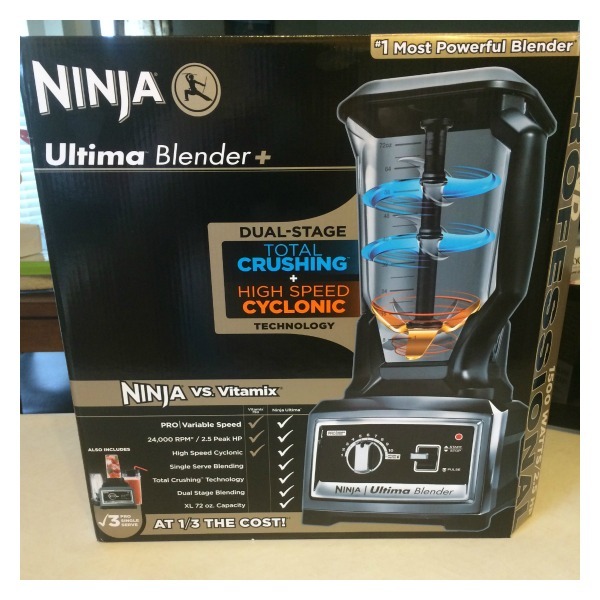 I also appreciate having review and comments from those who also own a Vitamix or other high end blender and how this fantastic Ninja compares. Hi! This sounds really cool! I can’t believe how many different things it can be used for. Even grating cheese?! Neat! Thank-you for your review! Gave my dad one for Christmas and he loves it, doesn’t let anybody else use it. Now I want one!! This could replace a lot of items we have since it does so much. Love that it will grind meat as well, how cool of an item this is. This blender looks great. It seems to do pretty much everything in your kitchen except for cooking dinner. This would be great to have. My blender is an old blender and it doesn’t even really blend anymore. The items mix on the bottom but they just sit there on top. I would love to have one machine that can mix, blend, grind, grate + more. This is a fantastic product.so many uses.you can make many many meals. This is a must have for any one who cooks. I’ve got a great juicer but it cannot do banana and yogurt etc for drinks. I’ve been thinking a blender should be added to our small appliances collection. Based on your review this blender looks like it would be a perfect addition. And with ideas like soups, i would use it all the time. This certainly looks like a blender that can do a lot in the kitchen. I think it is interesting that you can make soup with it. Thanks for posting this review on the Ninja. I had heard of this blender but only in passing. It looks like a very sturdy blender that does the job well. A question for you would be, how loud is it compared to other blenders (like your Vitamix)? I know blenders are naturally loud I just felt like our old one was just insanely loud and not very powerful. You had me at “ice cream maker”! I need to get my hands on one of these. Is it bad that I’m already starting my Christmas list?! This would be so nice to have. I make smoothies every morning and it’s a chore to get all the fruit blended. First of all, my blender is not powerful enough and having only one set of blades in an extremely narrow space doesn’t allow anything to blend unless I continually stop it and rearrange the contents. Great review. I have an old Ninja and it has changed the way I think of blenders. Before I used it only for making icy drinks. More like Ice chunk drinks. After I got a Ninja I realized how a blender should work. It beats up anything you put in it. Ice turns to snow…REALLLY!! Snow. no chunks just flaky snow. which btw makes making snow cones a really fun project. This looks like what my family needs! It appears that this is a very high quality, sturdy machine that can take care of about anything put into it. It seems like every blender I try gives out in a couple of years with all of the smoothies we make. This looks like the one I need to buy! Thanks! i love the blades in this. Ive had so many crappy blenders that can barely crush ice but this one is beast. I would make so many yummy smmooties in this. That is a blender! Mine overheats when I try to make a milkshake. first thing i will make is ice cream. i watch the infomercial a lot. I know this product is great, as we have friends who own one, and they rave about it. They say it’s better than a Vitamix! I’m sold on this, and what it all makes. Everyone could definitely use one of these, especially our family. A meat grinder and ice cream maker?! Wow! Is what I have to say. I would love, love, love, to own one. I could get much use out of this bad boy. Awesome product that does much. Going on my Amazon wishlist. It sold me on the following: 2 Nutri Ninja cups with sip and seal lids, allowing you to make personalized drinks to quickly bring with you on the go. I’m always looking for something quick in the morning and this would be great…. Wow! I was surprised to see how well the Ninja crushed ice! It even beat out the Vitamix! Working in an ice cream store for years I know the quality of having a good blender. Would love the chance to win a ninja for our home. 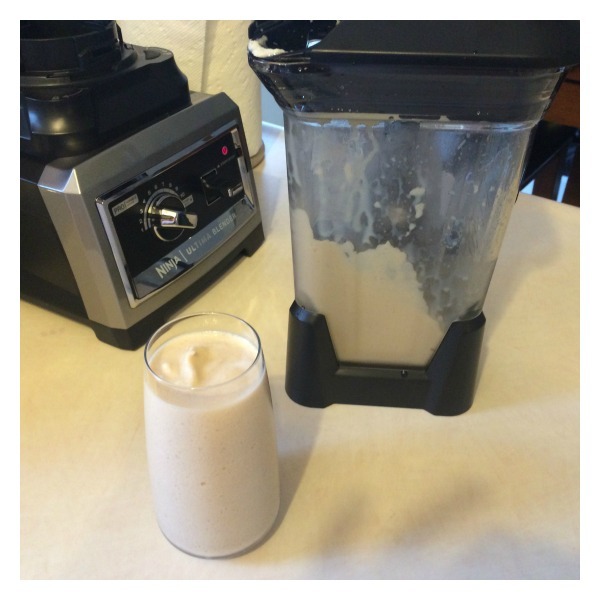 The fact that you have a Vitamix and were able to compare the 2 is awesome! We have been on the fence for quite some time as to which one we wanted to get!!! Thanks for the review! We’ve been in the market for a new blender for awhile…we do a lot of smoothies & shakes but also want one a little more power to be able to do things like make some almond butter! I’ll have to check this one out some more. This blender looks amazing!! I cannot believe how many uses it has! I would really love to have one of these in my kitchen! I love these blenders. They are really nice and have been on my want list for a while. I would love a blender like this! My husband would love it, plus you can purchase it on amazon, love it! Great review! I love this blender, and I hope (fingers crossed) to have one soon! My dad has one and he loves it. He uses his to make slushies. LOL! I got a lot of use out of my old ninja. I tried to make cookie dough in it and was that ever a hassle. Will never try that again. This one is more powerful than the one I had and even looks more awesome! I may need to invest in one! I love the fact that it can also process food. I have a processor that where the bowl is way too large so this looks like it would work way better. I would love to have a Ninja blender, the one I have now is a cheapy one and I still use it often. Wow. I didn’t realize it was comparable with the Vitamix. I have been wanting to get a good blender, it’s good to know there is a less expensive alternative. I love all the things these blender can do it is amazing,I would love to make a smoothie.You could really replace several appliances if you had a ninja blender. Thank you for your review. My neighbor has been raving about the Vitamix for so long, but after reading/seeing the comparison, I’m sold on the Ninja Ultima! This blender is definitely at the top of my list for new kitchen appliance picks! Thanks for the review and information. Oh I want one of these. I need a new blender and I would love to make my own nut butters and flours. I thought I wanted a Vitamix but after seeing the video, I’ll take the Ninja, thank you. I just visited my cousin who has one and it was really great! Easy to use and efficient! My wife and I have been wanting one of these for a while. Looks like a really nice blender that does quite a bit. I have been wanting one of these for forever! They are super awesome and do EVERYTHING! Would love to make tons of smoothies in this sucker! Very cool! Wow, thank you. I have heard things about the Ninja but never really looked into it. My Magic Bullet just broke and I can tell you if it did not break on it’s own I would have done it. On the Ninja I love the blades. It appears it would do anything! I agree with someone above I would love to make nut butters with this as well. I too hate using my blender now but I have found a simple way to clean it. I put water in it with a bit of soap and hit pulse a couple of times. Usually does the trick. Oh my! I have wanted a Ninja so bad for so long. The time is near, too. Having recently moved once I find a space to keep it we will get it! I have been researching information about buying the Ninja vs. Vitamix for a couple of months and I think the Ninja sounds like a winner for sure! My family is striving to make healthful changes in our diet and my kitchen aide blender died so it’s time for a new blender. I appreciate the information you have shared here about the Ninjas qualifications as an awesome addition to anyone’s kitchen utilities! Thank You! Wow! This does so many things. They blades are strong enough to crush ice, and I like that it grinds meat. A very handy appliance to have in your kitchen. i love my ninja except when u make milkshakes, they come out like whipped cream. Very powerful machine works great. Love that you have a review of the Ninja. I always hear everyone rant and rave about how great they are, but I’ve yet to read an actual review. I just bought the worlds cheapest blender and I am deeply regretting it! I need a Ninja! I am soo tired of wimpy blenders. This one is hands above every other blender on the market. When this one is sitting on my counter you can be sure I’ll brag about it to everybody. I love that you can make so many things with this and it sounds easy to do so – I feel like our current blender always has chunks left so I’m shaking and stirring trying to get it all the same consistency. I’ve never tried to make my own nut butter, but I’m intrigued! Wow,sounds like the Bee’s Knees to me! I really want to get one….maybe for my birthday! I love the Ninja Ultima Blender. I didn’t realize it could do all those things. Now I love it even more. I really hope I win one at some point, I don’t think I can afford one. I had a Ninja before but I dropped the blender cup and ever since I have not been able to afford to buy one. I miss my Ninja more than anything and I really miss making fresh fruit & yogurt smoothies. It would make the best smoothies, better than any bought at a store or restaurant. Thanks for the review. The Ninja Ultima Blender is really strong which is great because you can make sure everything is actually blended! Love the dual blades. I like that it gives you restaurant quality smoothies, smooth ice and not chunky. It was good to read that there are safety safeguards and built in mechanisms to keep it safe and mess-free. I had been eyeing the ninja blender, and I’m glad I found this review. I was worried the ninja might be another one of those gimmicky products that falls apart after a while. I’m glad you included commentary on how it compares with the Vitamix too; the Vitamix was my dream blender, but I think now the ninja is (and its much more attainable)! This looks like it’s really got the power to make smoothies! At our house we prefer our smoothies made with frozen fruit instead of ice, and it was really hard on our blender (it does after two months). Hopefully this one stands up to daily use for you! This looks like a fantastic blender. I would love to see how it does making squash soup, our family favorite. My old blender doesn’t get it quite as smooth as I like. I didn’t realize the ninja did so many different things. It sounds amazing. And I agree about making my own shake or smoothie rather than buying the prepackaged kind. I like making my own because I know what’s in them. Looks very cool. I know my wonderful fiance would love one of these. I have a basic ninja and love it. It’s so much more powerful than normal blenders. Would love to upgrade, though! Love how this blender crushes ice so well. This would definitely be nice to have. wow ! what a “all-round” Kitchen Tool . Luv it !!! I have been interested in a Ninja since they first came out, but now I truly have an everyday use for one! I have started drinking protein shakes everyday, and would love to be able to make smoothies instead of the shakes. With the Ninja I would be able to use a variety of fruits and vegetables, along with ice, and make a high fiber smoothie! Definitely want one after reading this post! I’ve heard such nice things about the Vitamix, it speaks volumes that this blender stacks up nicely when compared against it. Perhaps I’ll have to check it out! My wife and I got a Ninja blender (not this model) for our wedding and we LOVE it! I’ve been using it for almost 2 months now. I make daily smoothies and this is a really impressive blender, with a ton of power! I have wanted one of these for a while now. We make shakes and smoothies regularly and our blender is about to die. I keep hearing about the Ninja blender but never paid it much mind as I already have a blender and I HATE cleaning them out…the Ninja looked no different…until I read this review! I can’t believe that it replaces everything…an ice cream maker?! Impressive! I just bought a Cuisanart… And I’m not impressed with it. It pours so badly. It sloshes everywhere and it drips down and into the bottom ring/stand. I’ve already decided it has to go back. I’d love to go with the Ninja instead. The dual blades would be nice. No more having to stir or shake mid-way through the blend. It would be great for making frozen fruit smoothies on those hot summer days. I have only heard great things about this blender! Would love to have one to make purees, soups, smoothies, and more! Love that you can use it as a meat grinder. I’ve never heard of a blender that can double as that! And I hate using blenders that leave ice chunks. This one sounds like a quality winner! I’d LOVE to have this newer model. I’ve got one, but it’s much older, and I’d be in heaven if I could have one that did all the things this newer one can do. I’d especially love being able to make ice cream! I like to make fruit and veggie smoothies. Celery and leafy vegetables are so hard to blend. They just get stuck in the top of the blender. The Ninja would take care of that problem! If I had one of these, I would be making milkshakes! And gaining 20 pounds pretty quickly, lol. When I could eliminate a number of appliances because of the versatility of the Ninja Ultima Blender, I would be thrilled. My kitchen is on the small side and the Ninja would free up some much-needed working space. A powerful blender that can do anything is a fantastic item in the kitchen. Also, the easy clean up is a definite positive for us! This sounds like a great blender and I would love to have one. The blender I have now works but I think it need to be replaced. This blender looks amazing and looks like it would get the job done very well. My family would love to make milkshakes and almond butter in here. This definitely looks like a tool that could eliminate other kitchen tools to help save space! I love this! I love the size, this is perfect for a family. I would love this as a gift for my husband. I’ve always wanted a Vitamix – or so I thought – to make all my smoothies, raw date bars, gluten-free pancakes, etc. However, the Ninja just looks so much better and more of an all-around appliance (I hate having to pull out something different for everything I do – I am a minimalist!). I love that it is more than just a blender that it has such a wide variety of uses and modes to contemplate and use depending on what you make. I also find it true that I tend to not use the blender that I already have very often because of the mess it makes and for the stress/annoyance of clean up. However the Ninja Blender seems like it would be an excellent buy and much needed replacement for my current eight year Oster blender. Will definitely look into upgrading soon. Thank you for your honest review and opinion. it is a really powerful blender/food processor and i would love to own one. i like the fact it is dishwasher safe as well. thanks for the review and i would like to see the comparisons to a vitamix. My friends love their Ninja Ultima Blenders and I have to say that I’m jealous because my blender just doesn’t perform well when it comes to crushing ice and making great smoothies. The power behind this machine is awesome. I would love to have something I could depend on like the Ninja. This Ninja Blender looks like it would function much better than my current blender, which I’d really like to replace. Need to get ready for those Summer Smoothies! Wow! This blender sounds amazing! We are currently shopping for a new blender & this one has everything on our checklist! Thanks for your honest opinions! This looks like a really great blender! Mine has not been working well, and I really could use one that is good for ice and frozen fruit. I have heard a lot of good things about the Ninja brand! Great review. I love a powerful blender, especially one that can replace my big and bulky food processor. I did not know that it can be used for making ice cream. This is definitely a high quality blender! Our family would use it for crushing ice and making milkshakes. My Magic Bullet took a nose dive. I am in search for a new one. Your review has sold me on the ninja. Now only if I could win one as the price is steep. I love the fact that you can use this blender for so many things!! This will eliminate the need to take up space buying other gadgets. I love that it is an ice cream maker!! My kids will have a lot of fun, as will I, using the Ninja. Crushing ice is one of the most important aspects of actually having a good smoothie or blended product. I know it really means alot to me. This one looks like it can do miracles! I like the sip and seal cups, so I can take my smoothies on the go.Also,I like that it is powerful enough to make ice cream,which is unbelievable,and impressive. I would love to have this Ninja Ultima Blender sitting on my kitchen counter. I love the power of it. I’ve been through three blenders in four years. I can do what I need but never been able to experiment with much food processing such as nut butters. This sounds so amazing to use. My son has Celiac’s disease and is type 1 Diabetic with a heart transplant. Cross contamination with Gluten is important to be aware of in the kitchen so he has to have all his own appliances. Cooking now has become his hobby and he is always trying out new recipes and making smoothies is what he finds to be healthy making them with veggies and fruits. I have heard that the Ninja Ultima and really blend it all up no chunks which everyone hates in their drinks this one looks amazing to use. I love that its an all in one cooking machine. So if im making soup or a smoothie, or heck even grating cheese its going to do it all for me. Sounds like an easy cooking and cleaning up experience. I’ve had a low-end blender for years and hardly ever use it, probably because it doesn’t really do anything well. This Ninja Ultima might just be what I need to upgrade. Food for thought, for sure. Thanks for the review. I love this blender. I did not realize how versatile it can be in the kitchen! I’m so glad you did this review and included the video clip. I actually have the ninja blender…and have only used the small processing cup for grinding/shredding carrots for a very healthy yummy carrot cake recipe. But the blender came with the large capacity cup as well…which I have yet to use. I love the product! I’ve always wanted a Vitamix and now I can just get the Ninja instead. Thanks for the review. I would love to use this for smoothies. This looks so high-quality. I have heard so many good things about this blender. My wife and I have been wanting one for a while. We like to make smoothies and I think this would be perfect. I would love to have one of these so I can make my elderly mother her morning smoothies as well as I would like to do some juicing. I also make many soups and this would be perfect. I can’t believe how many small kitchen appliances/gadgets this one blender would replace. This blender looks so awesome. I would love to have one to make smoothies for my family. Thanks for such a thorough review. This blender looks very nice. Thanks for sharing! This sounds like the ultimate blender, one I can do lots more with than the normal blender. Cant wait to make some smoothies in it .Thanks so much for this review. Canbyou make mayonnaise in this blender? I am very UNIMPRESSED with the Ninja Ultimate Blender I just purchased….very first attempt at using it was to make Peanut Butter. Halfway through the process, the thing SHUT DOWN and the bottom was smoking (seemed to be too hot). I unplugged it, took the top off for about an hour and it STILL doesn’t work. It sounds like you have a unit that might be a lemon 🙁 Mine works better than Vitamix (I have gone through 3 of them that would smoke).